Artist Alan Ball on river ceremonies, London fog and the deep-time of geology. ‘On 17 July 2017 it was the 300th anniversary of the Water Music premiere. 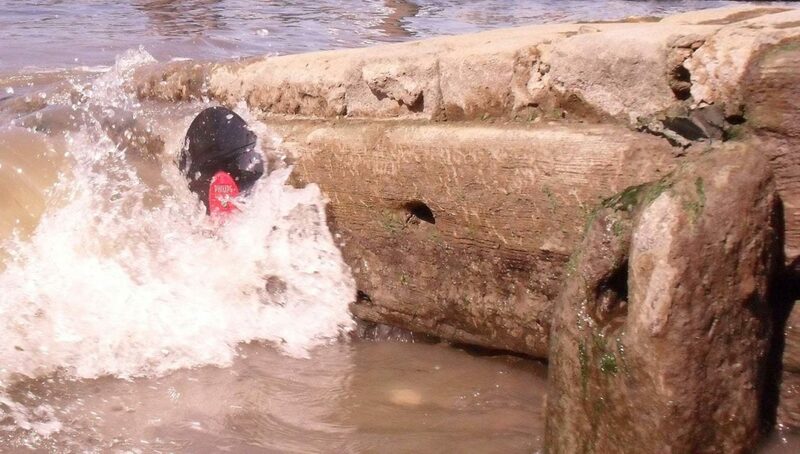 I had my record under the water that day. Handel’s piece really got traction for me when I realised that both Handel and King George I were German, and in ecological terms there was a time when the River Thames was connected to the River Rhine. This was a time before Britain was an island, when it was fused to the continental mainland. The fact that these two rivers were flowing into each other made me think about time on a huge scale. I was interested in the idea between micro and macro when I realised the way that rivers are formed by geology, glaciation and these vast blocks of ice which would scour and gouge the landscape. And then thinking that visually, at a micro level, this is the same way that the stylus of the record actually engages with the grooves of a record player. It is only recently that I looked at an image created by micron-electron photography, which showed great detail of a record player – it does look like a huge diagram of a geological process. A vinyl record is an embodiment of certain geological processes – vinyl is a byproduct of oil, and oil is created from a sedimentary process principally taking place at the bottom of the sea. By putting a record in the water, it seems to me as if it is returning to its source. I also like the idea that while I am sleeping, the river is making the work for me, by abrading the record. 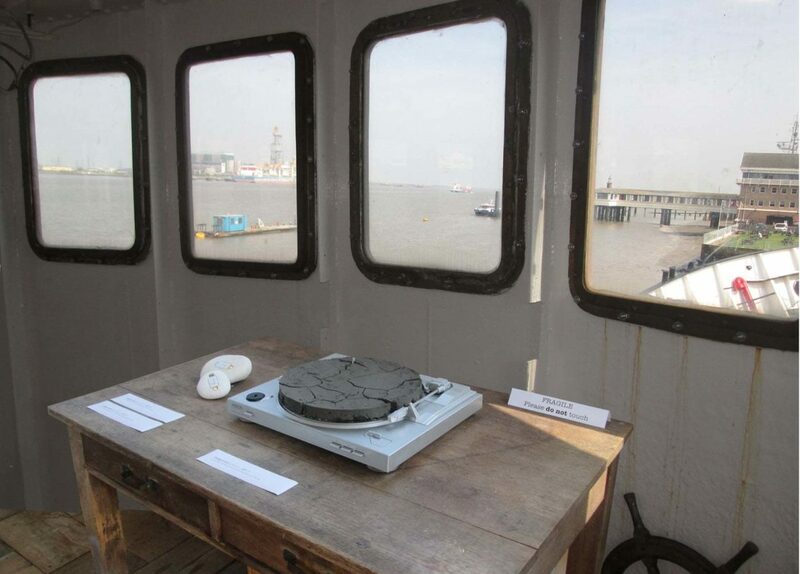 In April this year, Alan exhibited his Anthropocene series of objects aboard the lightship LV21, as part of the Inspiral Kent Festival.The series displays a process of inserting USB sticks into hollowed chalk; the exposure to chalk ultimately rendering the data on the USBs unuseable. 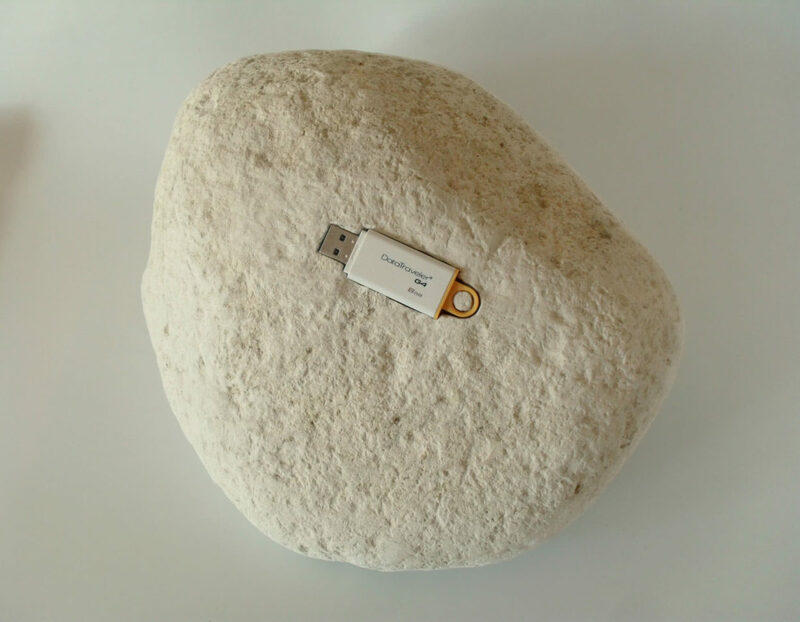 Each chalk houses one USB stick and each USB sticks contains only one single file – in this case each chalk contains a film. One is a single static shot of the the Crow stone and the other a film of the London stone. 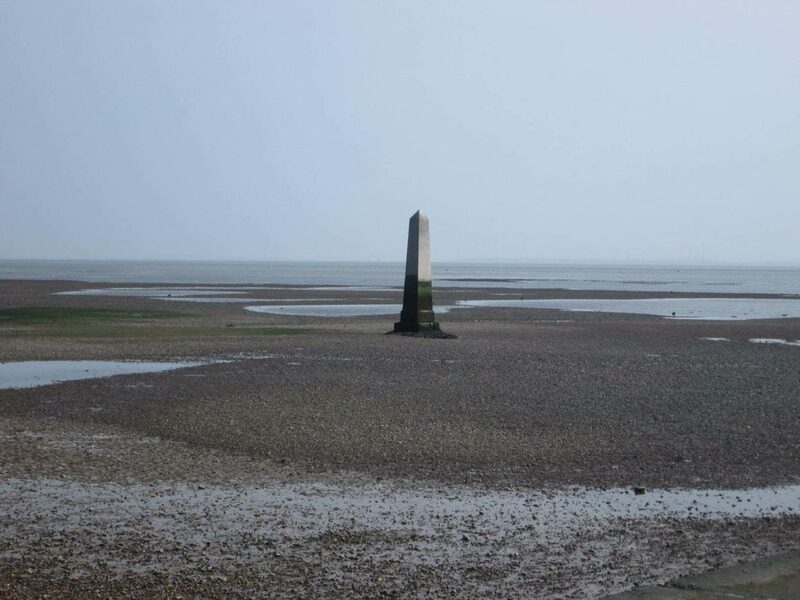 These are two obelisks which stand on the foreshore directly opposite each other, one on the Essex side, the other on the Kent side of the estuary. The imaginary line between them marked the eastward limit of of the jurisdiction of the PLA (Port of London Authority) over the river, where the river becomes the sea. It is a boundary point. When you have a boundary point over the sea, it is quite a hubristic thing to do: to draw a line over and through something that is fluid. The other ‘ology’ my work is concerned with, besides geology, is folklore. A lot of my work is about the mythology of the River Thames. In particular there are a lot of annual festivals that I go to which are connected to the river. One of them is the Beating of the Bounds. There is also the Deptford Jack, which processes along the river through Greenwich. The Deptford Jack ended in the late 1800s but it has since been revived. This is a kind of ceremony blessing the fact that the winter is over. It is like a kind of a pagan fertility rite, where a man dressed as a huge flowering tree walks around whilst lots of instruments are being played. The Beating of the Bounds is at All Hallows [the Parish of All Hallows by the Tower], where the northern boundary of the Parish is actually in the middle of the river. So that involves school children going out on a boat, getting a big birch twig and beating the water in the middle of the Thames. I have photographs of these old pagan rituals with a backdrop of a contemporary London skyline. I quite like the mixture. There is a piece I have been making for quite a while which is a remaking of a Hogarth engraving, from his Idol Apprentice at Sea series. It is an image of the main character Thomas Idle, on a boat on the River Thames. What I have done is to introduce a figure from William Blake into a Hogarth print. I want them to have a kind of confrontation. It is William Blake’s depiction of Sir Isaac Newton. He was Blake’s bête noire. He represented everything Blake hated: a kind of mechanistic universe. I have taken the figure of Sir Isaac Newton and put him on the boat of some of Hogarth’s figures. One of Hogarth’s figures on the boat is giving the gesture of the cuckold, which relates to a place on the river called Cuckold's Point which you still see on old maps. 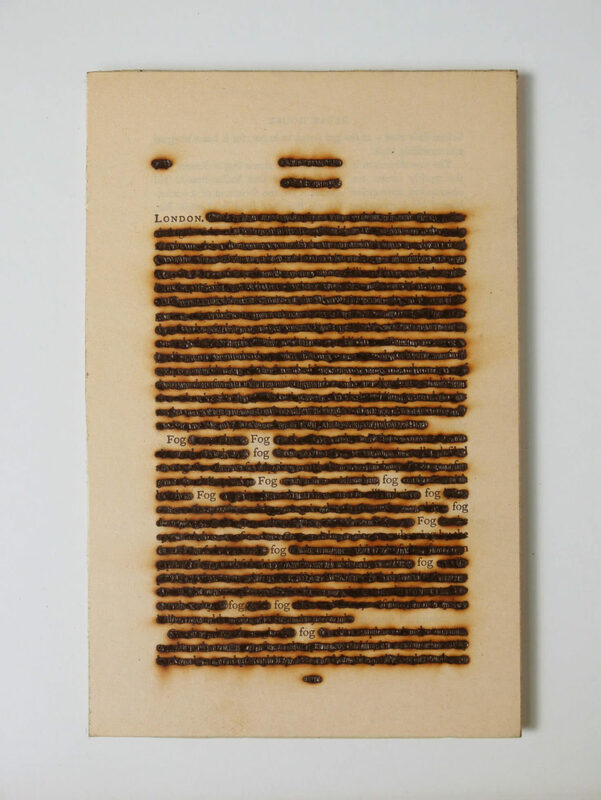 One of Ball’s recent projects pulled the opening pages of Charles Dickens’ novel Bleak House, famously personifying the London fog, and exposed them to the harsh light of the summer sun. ‘The sun removes everything apart from the word fog. I was trying to get two opposing meteorological conditions into the same image. If you think of fog as the absence of sun, then with this piece I need it to be as sunny as possible. I need it to be 28-30 degrees to allow the sun to burn through the piece. Primarily it is a series of dark and light lines- dark where it is etched. When you actually look at it, it does something strange to your retina – it actually starts vibrating a bit like a Bridget Riley painting – a side effect I wasn’t quite expecting. The first page is Dickens describing the fog coming off the Essex marshes and the Kentish hills, and coming down into the valley of the Thames and settling on the Thames, and the fog seeping down into the cabins of the boats and then finally into the stem and bowl of the Captain’s pipe. The fog is twice as thick on the Thames as anywhere else in London. It is quite remarkable. It changes the acoustics.